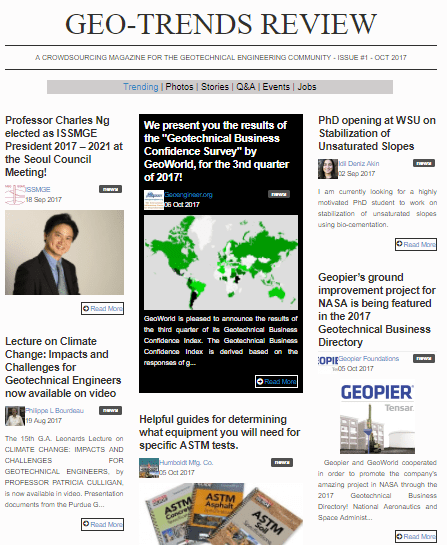 GeoWorld members post and the hottest, most exciting news are disseminated to 7,500+ member quarterly. The magazine is designed to reflect GeoWorld’s dynamic and unique content! It is full of news, blog posts, questions and answers and photo albums by GeoWorld members. Geo-Trends Review is published quarterly and distributed to all 7,500+ GeoWorld members! In this Magazine, GeoWorld members are the author and their message reaches directly thousands of professionals! It is the first interactive magazine that has contributors professionals and distributed to professionals and companies. Click here to see the issues.